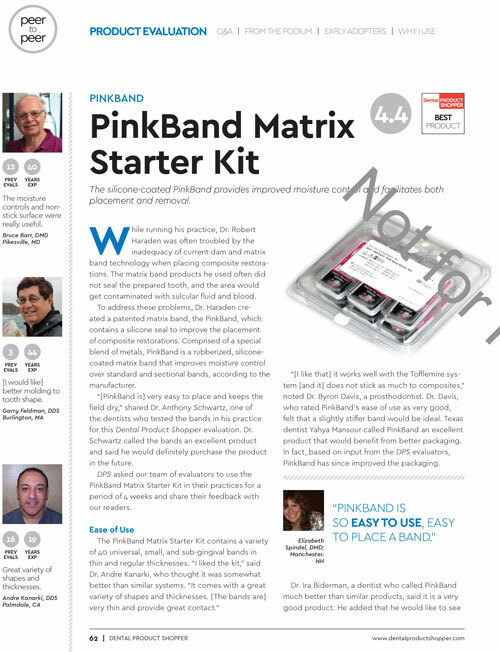 PinkBand®, a rubberized silicone coated matrix band for use when placing composite restorations. The silicone coating provides and additional seal against moisture contamination within the confines of the band, and it also facilitates removal of the band. PinkBand® is a Tofflemire-style band is available in Unversal, Pedo and Subgingival sizes. 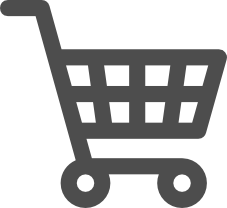 Bands are available in both Regular 0.0018″ and Thin 0.0013″ thicknesses in packages of 25. 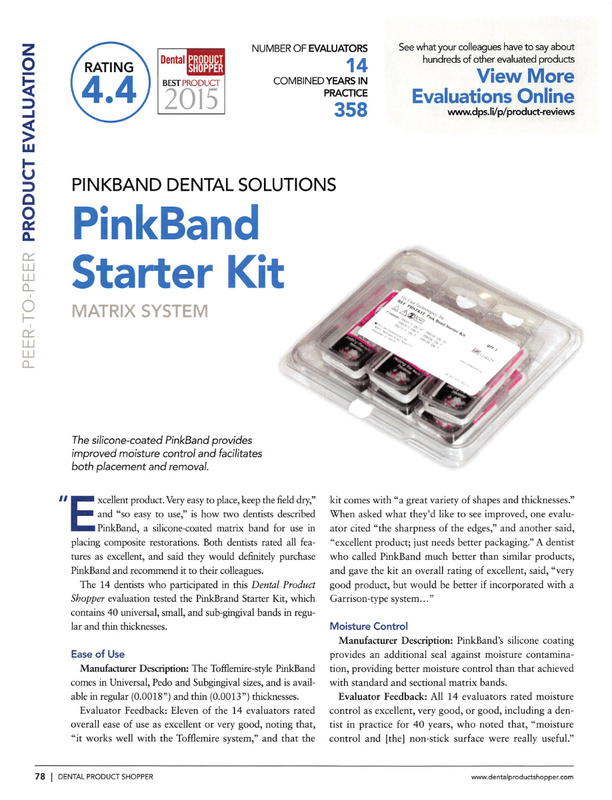 PinkBand® was evaluated by 27 dental consultants who placed 479 composite restorations in patients. The silicone-coated matrix band received a 98% clinical rating. The silicone coating of PinkBand® is effective in improved moisture control over standard sectional matrix bands. The silicone coating also prevented the composite from sticking to the band, making the removal smooth and easy. The Universal, Pedo and Subgingival sizes fit well into matrix retainers. 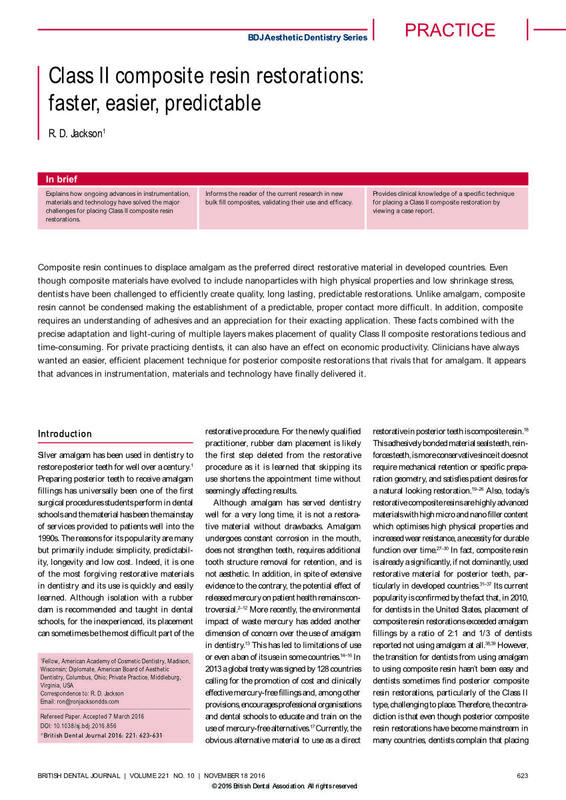 Consultants had individual preferences on the thickness of their bands for composite restorations. Some preferred the Ultra Thin Bands, while others preferred the stiffness of the Regular silicone-coated bands. Some consultants noted that the thinner bands tore more easily during tightening, compared to the regular bands. 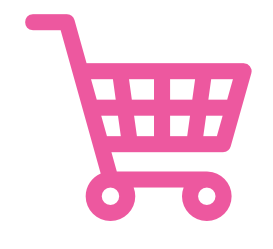 80% of dental consultants rated PinkBand® better than other matrix band systems they are using currently using and 20% rated it equivalent. 100% of dental consultants would switch to PinkBand® and would recommend it. Open interproximal contact to ease placement. To prevent tearing, do not over-tighten band. Burnish the band against the adjacent tooth with a rounded instrument. May need to hold the band against the adjacent tooth with an instrument to achieve proper contact. I wanted to let you know that I have been using the PinkBand Contoured regular coated matrix bands in my dental practice for 3 years now and I like the rubber gasket that keeps the prep dry and blood out! Its also easy to place and to remove. Thanks for a great product that helps our day go smoother.